After 25 people were killed and over 60 wounded in southwest Iranian city of Ahvaz, Islamic republic accuses Western countries of harboring 'members of terrorist group' that committed attack. Iran has summoned diplomats from Britain, Denmark and the Netherlands over allegedly harboring "members of the terrorist group" that launched an attack on a military parade in the country's southwest. 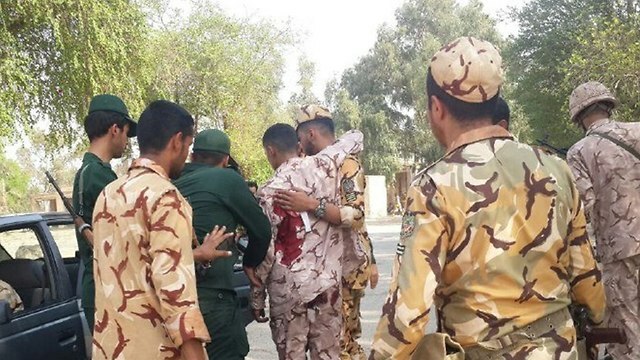 Gunmen attacked a military parade marking 38 years since the Iran-Iraq war in the southwest Iranian city of Ahvaz on Saturday, killing 25 people, half of them members of the Revolutionary Guards and wounding over 60. All four assailants who carried out the attack were killed. A statement early Sunday from Iran's Foreign Ministry also quoted ministry spokesman Bahram Qasemi as saying Danish and Dutch diplomats were told Iran "already warned" their governments about this. The statement also criticized Britain over a Saudi-linked, Farsi-language satellite channel immediately airing an interview with an Ahvazi separatist claiming the attack. Arab separatists in the region claimed the assault and Iranian officials believe they carried it out. The Islamic State group (ISIS) also claimed the attack, but initially offered incorrect information about it and provided no proof. On Sunday, Iranian President Hassan Rouhani accused the US of being a "bully" that wants to create insecurity in the Islamic Republic. Speaking before leaving Tehran to attend the UN General Assembly in New York on Sunday, Rouhani accused US-backed Gulf Arab states of providing financial and military support for anti-government ethnic Arab groups. "The small puppet countries in the region are backed by America, which is provoking them and giving them the necessary capabilities," he said. "Iran's answer (to this attack) is forthcoming within the framework of law and our national interests," said Rouhani. "The Persian Gulf states are providing monetary, military and political support for these groups," Iran's president stated. "Hopefully we will overcome US sanctions with the least possible costs and make America regret its aggressiveness towards other countries, and particularly Iran," Rouhani added. On Saturday Iranian Supreme Leader Ayatollah Ali Khamenei accused US-backed Gulf Arab states of carrying out the attack. Foreign Minister Mohammad Javad Zarif said after the attack Iran would respond "swiftly and decisively," holding agents of a foreign regime responsible. "Terrorists recruited, trained, armed and paid by a foreign regime have attacked Ahvaz," Zarif tweeted. "Iran will respond swiftly and decisively in defense of Iranian lives." See all talkbacks "Iran summons Western diplomats over parade attack "